Visit Us Today at Dogtoberfest! 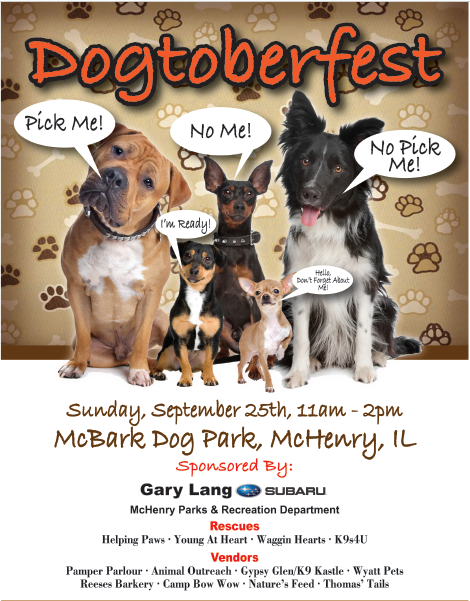 If you're looking for something fun to do on this beautiful Sunday, come on out and say hi to Young at Heart at Gary Lang Subaru's Dogtoberfest - Rescue Event - McBark Park in McHenry from 11am - 2pm. Vendors and Rescues will be there and you are welcome to bring dogs with valid Rabies and Distemper shot record (must bring with you).